Grant request fulfilled for 8 year old Emma | Making a positive difference! AN 8 year old girl is on the road to recovery after a life changing operation to help her walk without pain. 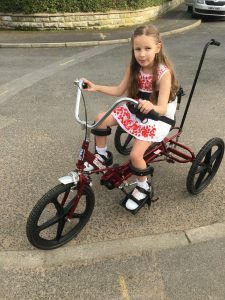 Her recovery is being helped after she was able to get a trike with funding provided by Community Link Foundation to help improve her mobility. Emma Burrows from Ormskirk has Cerebral Palsy Spastic Diplegia that mainly affects her legs. Her family and friends did months of fundraising earlier this year so that she could have an operation at Alder Hey in August. The operation was not funded by the NHS so family and friends raised £21,000 so that the operation could go ahead. Her disability mainly affects her legs, but the source of the problem is damage in her brain which affects the nerve impulses that control her muscles. Specialists at Alder Hey offered Emma an operation called SDR which involves cutting some of the nerves in her spinal cord that transmit signals between her brain and legs. This will prevent the faulty nerve impulses that cause the uncontrollable movements in her legs. Initially Emma’s family applied to Community Link Foundation for help with funding this operation but the family managed to raise the amount needed within three months via donations and events. So, Community Link Foundation agreed to fund a trike for use after her operation to help with her mobility. Emma has regular physiotherapy sessions and along with the exercise that she does on the trike, she is making great progress. Her mum, Rachel Burrows, said: “Emma is doing really well after her operation. She had a three week stay in hospital and has been working mega hard to build up her muscles as the spasticity prevented her from using the muscles previously . “The trike is great fun and she’s loving cycling around the street to build her strength and fitness. She’s nearly three months post op and is getting fed up of the physio twice a day but the trike brings such a huge smile to her face and she would cycle in rain, wind or shine if she could. For more information about Community Link Foundation and the work they do in the local area, please go to www.clfoundation.co.uk.